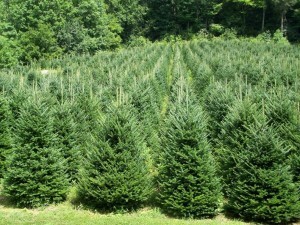 Blog / Trees / Whence cometh our Christmas trees for Yule? Whence cometh our Christmas trees for Yule? 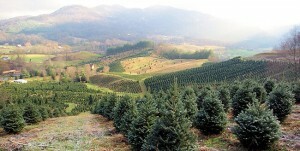 Have you ever seen the acres of nicely shaped Christmas trees on a farm and wondered how the farmers do that? 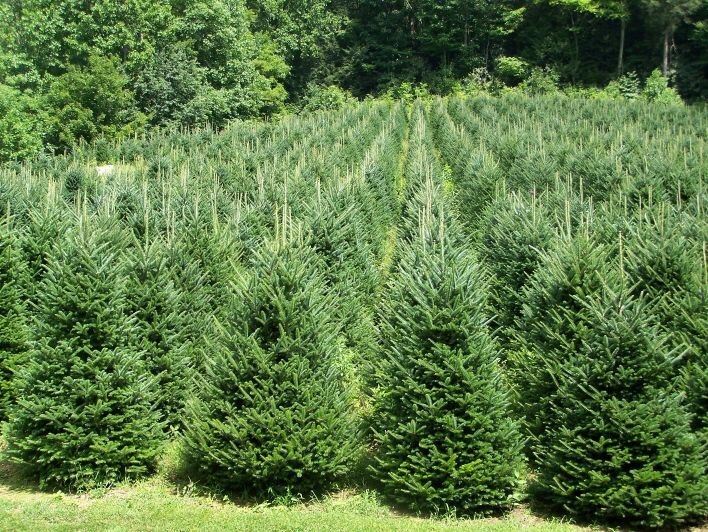 Although there are several tree species grown for this purpose, in western North Carolina the most popular is the Fraser fir, followed by Colorado blue spruce, white pine, and sometimes Scotch pine. Each has special cultural needs and shearing techniques so let me generalize on what goes into preparing a 6-8’ tree for sale. Seeds are generally collected from the wild. They’re cleaned, chilled, and sown into well prepared beds where they receive lots of TLC in the form of irrigation, weeding, being covered with a shade cloth, pest control and more. Even so, germination is low, perhaps only 10%. Two to three years later they are large enough to be moved into line-out beds for another two years until finally being transplanted into the growing field. A typical density will be 1500 or more trees per acre. Then starts the pruning and shearing that gives the Christmas tree its symmetrical and balanced shape. Timing and frequency depend on the species but most will receive one or more visits each year. The actual shearing can be done with hand pruners and machetes, but many growers will use some sort of motorized device, perhaps something like a weed-eater with a sharp blade. In addition to shaping, the trees must be fertilized, weeds controlled, pests spotted and controlled, and often irrigated. Finally, after at least eight to ten years and dozens of visits by the grower, the tree is ready for harvest. The consumer sees it, whether pre-cut, or balled and burlapped, or perhaps harvested by the family itself from a tree farm, as an important part of a holiday tradition. To the farmer that tree represents the maturing of a sizeable investment in capital and labor.